Under the culinary direction of world-renowned Chef Jean Joho, this 190-seat restaurant is Boston's first and only authentic French brasserie. Drawing on Chef Joho's Alsatian roots, Brasserie Jo offers the same style, environment and classic cuisine traditionally found in brasseries throughout France. 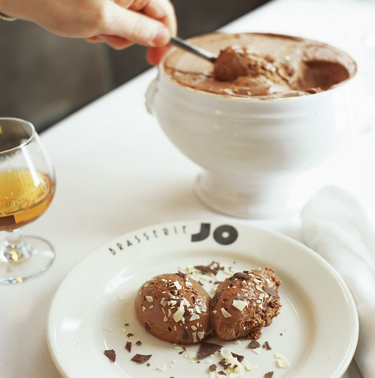 Brasserie Jo's extensive menu features a wide variety of light snacks and full meals, plus a selection of regional French wines and Alsace-stye beers. Uniquely designed to mirror a French brasserie, Brasserie Jo is divided into three spaces: a French bar for day-long sampling and sipping; a main dining area with a 1940s look; and a unique wintergarden. Characteristic of a brasserie, patrons can enjoy casual dining through the day and late into the evening. Brasserie Joe's private dining room, Salon Prive, is perfect for small gatherings of ten to larger gatherings of 100.